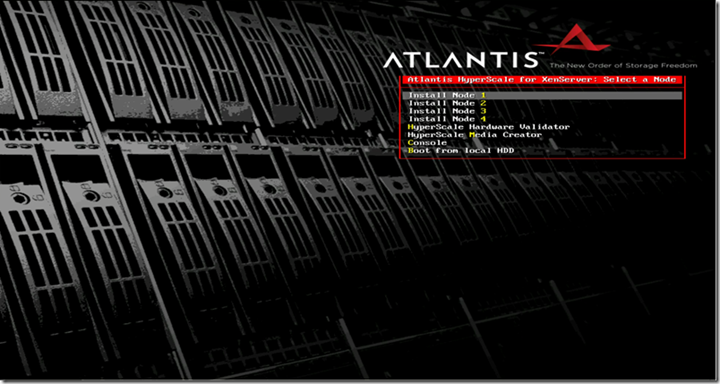 Home / Kicking into Overdrive: Introducing HyperScale, powered by HP and Atlantis USX! Over the last several years there have been a number of different technology innovations that have truly captivated my attention. Atlantis Computing’s ILIO product evolving into USX Software Defined Storage (SDS) is definitely one of these attention grabbing technologies! When I first learned about ILIO, I personally experienced the value software-based I/O acceleration and data reduction technologies can bring to Server Based Computing (SBC) and Virtual Desktop Infrastructure (VDI) environments, for both Citrix and VMware End User Computing. This was definitely game changing in the way I positioned, architected, and built SBC/VDI virtualized environments. With the evolution into USX, Atlantis built the leading Software Defined Storage platform for desktop or server virtualization that is shaping the future of the storage space in a similar way that VMware shaped the server and compute space. Working for a top reseller and systems integration partner, many of the Atlantis solutions I have built have been based on HP Industry Standard Servers (ISS) platform, including rack-mount and blade servers. In previous blog posts, I have demonstrated how to get up and running with USX 2.x, including several examples running both VMware vSphere and Citrix XenServer infrastructures to deliver and consume USX volumes. 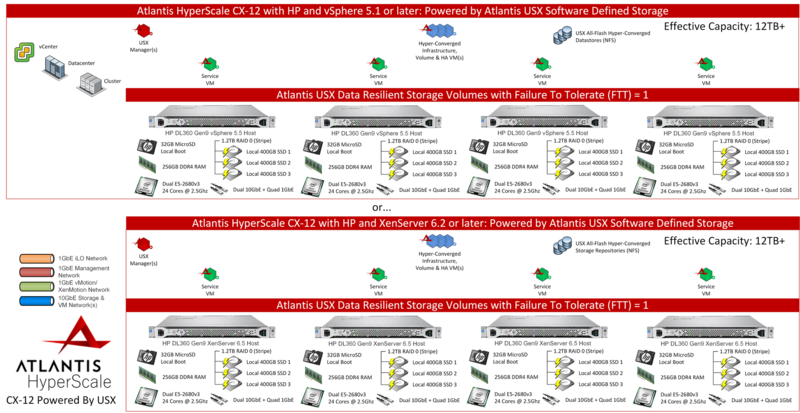 My colleague and EUC industry expert Andrew Wood has also created a blog series on Atlantis USX. As a Software Defined Storage platform, Atlantis USX is an open systems architecture, allowing partners and customers to deploy on any desired hardware platform, using VMware vSphere or Citrix XenServer. Additionally, Atlantis ILIO works across all three prevalent hypervisors, including Hyper-V, demonstrating Atlantis’ perspective on openness and freedom of choice. With the Atlantis HyperScale announcement on May 5th, 2015, I am excited to share that the game has changed yet again, making it easier than ever to architect and build Atlantis solutions on HP servers. When Atlantis started shipping product many years ago, I’m confident the company evaluated their options to bundle and OEM with hardware vendors or take a software-only approach. As a technologist and fan of all things software-defined, I’m very happy they decided to choose a software-only approach from the very beginning. To this day, they’ve stayed true to those roots regardless of shifts in the industry to do the contrary. To partners and customers, this enables the most flexibility and choice to architect and build advanced systems and solutions. In a lot of ways it makes me think of Intel and Microsoft in their approach to open systems architectures. If we’re honest, any innovative or disruptive technology that requires platform and infrastructure changes from a hardware perspective, quickly turns into a religious battle. That said, to certain markets and customers, it’s easier to consume a packaged solution that includes both the hardware and software components as it can shorten the Time to Value of their purchase. However, for many midmarket and enterprise customers this is often not an option if the hardware offered as part of the package is not accepted within the organization; Or if it is possible, the adoption process is slowed as the hardware standards are reviewed. I experienced this many times over the years working with innovative hardware technologies such as Whiptail (pre-acquisition). Introducing a new hardware platform requires a significant undertaking to gain consensus internally. Software on the other hand is often a different story! I wonder how different the server virtualization industry would look if 10+ years ago VMware had taken a closed architecture approach similar to Scale Computing. Certainly Scale Computing touts being easy virtualization, but this is also at the cost of being one of the most closed architecture solutions on the market (hardware, software, hypervisor, etc.). Don’t get me wrong, they’ve obviously been successful with this approach, otherwise they wouldn’t still be around. This type of approach simply isn’t for me, but I suppose I’m not their target customer or partner. At VMworld 2014, VMware took a bold step in the industry to create a compelling Time to Value proposition for vSphere and Virtual SAN while enabling partner and customer choice for the manufacturers’ hardware platform, with the family of VMware EVO Products. At launch, VMware had less than six partners onboard, but now there are over a dozen and customers are constantly asking about it. Openness and choice matters, manufacturers, partners and customers agree as demonstrated by the onboarding of new partners since launch (including HP who was not initially a launch partner). As my testing and validation has been on the HP DL360 Gen9 platform, most of this blog post will focus on my experiences using that manufacturer platform. I’m confident the experiences are very similar on the other hardware platforms. As a Cisco partner, I’m also very interested in testing out the Cisco UCS solution to share my results and provide our customers additional choices. As you can see, the solution includes several of the latest technologies such as Intel E5 v3 processors, 256GB of DDR4 memory, and Gen9 hardware. This is also one of the benefits that a software-only solution provides, you can best take advantage of manufacture’s hardware advances.. Courtesy of the high performance Intel S3700 internal SSDs and the USX All-Flash Hyper-Converged Infrastructure model, this solution has incredibly high performance! Based on my testing results using both Citrix XenServer and VMware vSphere, the CX-12 solution can easily deliver over 100,000 IOPS using a very intense I/O workload intended to simulate a VDI profile (4KB transfers, 80% random, 80% write). This visual demonstrates what the solution would look like with all cables utilized (which I would recommend). With Dual 10GbE connectivity for Storage and Virtual Machines, the additional onboard ports may be considered optional. However, I would recommend leveraging all 10GbE and 1GbE ports including the following per server: 1x Integrated Lights Out (iLO) (1GbE), 2x Management Network (1GbE), 2x vMotion/XenMotion Network (1GbE), and 2x Storage and VM Networks (10GbE). The Top of Rack switches are ‘customer provided’ (not included as part of the solution), so be sure to do a 1GbE and 10GbE port inventory and ensure that each of the pairs of network interfaces can be split across a stack of switches for highest system availability. Built around openness and customer choice, Atlantis HyperScale enables partners and customers to choose which hypervisor platform meets their requirements and works best for them. 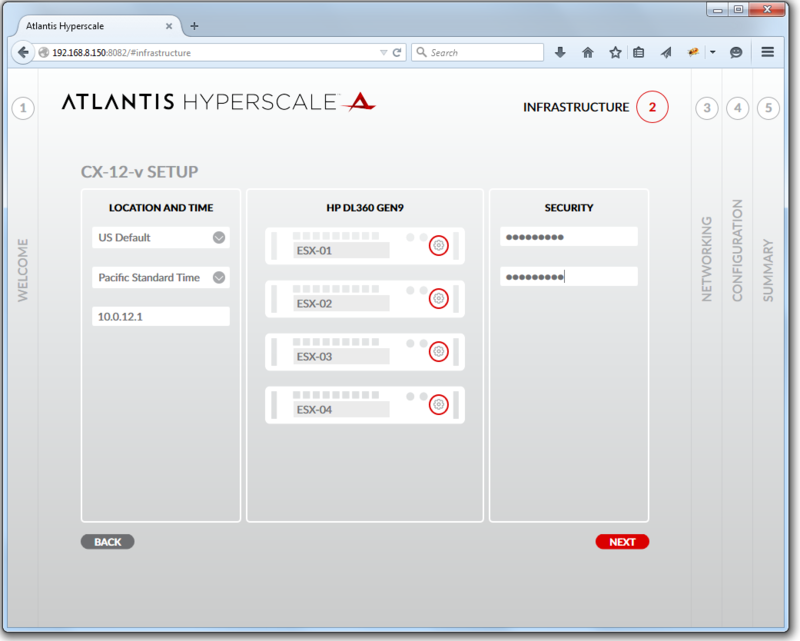 HyperScale is based on Atlantis’ USX product which currently supports VMware vSphere and Citrix XenServer. Over time, the supported hypervisor choices may expand, but these are the current platforms supported as of USX 2.2. In a similar topology to what I illustrated in previous blog posts, the following visualizes what a VMware vSphere (top) or Citrix XenServer (bottom) environment using HyperScale CX-12 would look like (click to enlarge). Atlantis has worked very diligently to ensure that the key value proposition of this solution is achieved by minimizing the complexity to integrate. Enter automation of all the things! Of course no day would be complete without cracking open a cold one after deploying HyperScale, and Atlantis has you covered! The current Atlantis USB stick doubles as a bottle opener. Thanks to automation, it’s safe to say that the hardware rack and stack, cabling, physical configuration, install, and configuration of a HyperScale CX-12 solution can be up and running within a single business day. Of course there are always variables, and ensuring that all prerequisites have been met helps to ensure fast time to value. With the HyperScale installer and enterprise server vendors ready to go to market, Atlantis is poised to continue the Software Defined Storage revolution, now easier than ever! I’ve been very excited to work with the Atlantis team, perform integration and validation testing, and support the storage revolution. 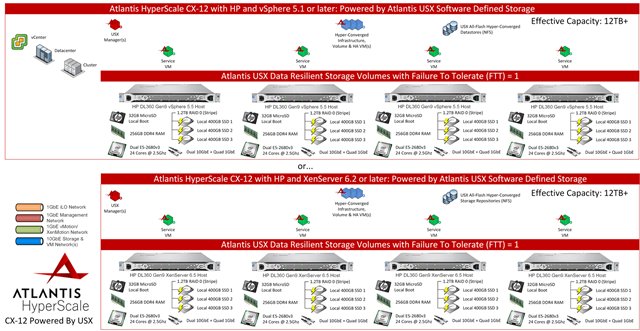 While ILIO and USX will continue to be available as stand-alone products, the HyperScale Solution bundle, with manufacturers such as HP, Cisco, Lenovo, and SuperMicro, will make the process of positioning and integrating Atlantis solutions easier than ever. By being able to use the latest in enterprise server hardware this solution is affordable and incredibly high performance! 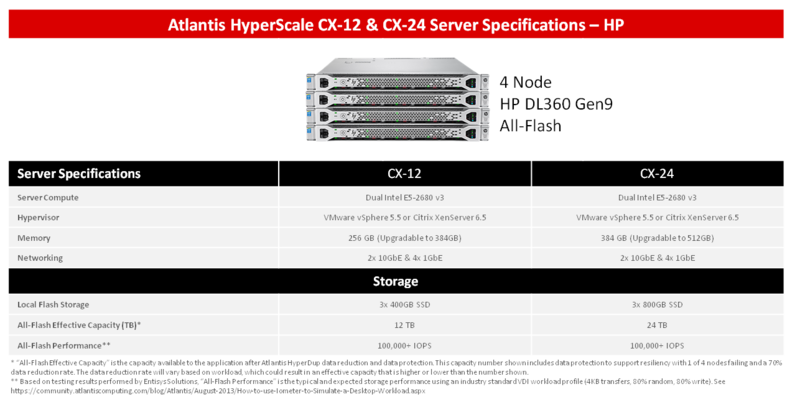 To learn more about HyperScale click here. As always, if you have any questions, comments, or want to leave feedback, feel free to do so below. #GOHyperScale! Very informative and exciting Dane. Thank you! Would be interested to know if Hyper-V will be a supported hypervisor in the very near future .. Very informative article Dane, thanks. Curious to see performance metrics vs. VMware Virtual SAN/EVO:RAIL, though I believe the inline deduplication and compression of USX would be one huge advantage.